So you want to steal your opponent’s monsters with Frogs? The Deck includes many cards that support Level 2 monsters, such as “Mimiclay”, “Speed Bird” and “Packet Link”, allowing you to quickly amass Level 2 monsters on your field. 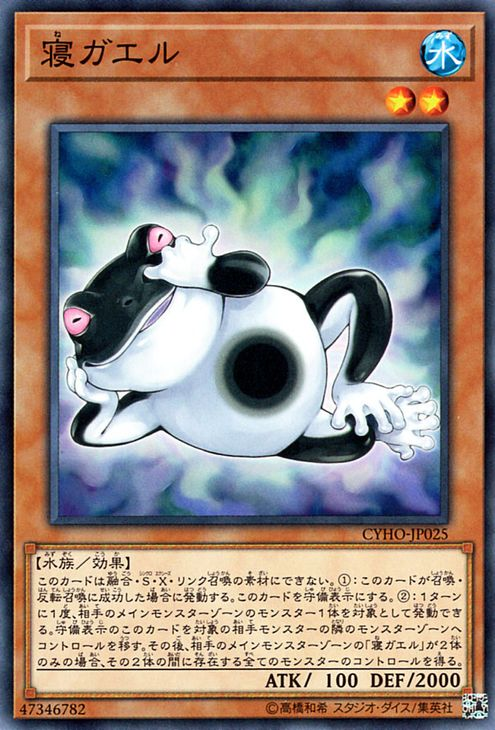 For example, by having the Rank 2 “Number 29: Mannequin Cat” along with 1 other monster in your Monster Zones, you can use the effect of “Give & Take” to Special Summon “Sleeper Frog” from your GY to your opponent’s field, while the 2nd effect of “Number 29: Mannequin Cat” can Special Summon a 2nd copy of “Centerfrog” from the hand, Deck or GY. The point of this is that “Centerfrog” lets you steal control of your opponent’s monsters depending on how your opponent has arranged their field, meaning “Wattkinetic Puppeteer” is useful in moving your opponent’s monsters. The effect of “Inferno Reckless Summon” lets you Special Summon “Centerfrog(s)” to your field, while the 2nd effect of “Borrelsword Dragon” lets you switch it to Defense during the Battle Phase, making sure you can use its effect that turn.